(L-R) Richard Pena (NYFF and FSLC), Jeffrey Schwarz (director), Charles Russo (brother), Michael Schiavi (Russo biographer), Philip Harrison (editor) at the Walter Reade after 14 October 2011 9:15pm screening. Image by: Martha Wade Steketee. The New York Film Festival is screenings and panel discussions and an embarrassment of riches. 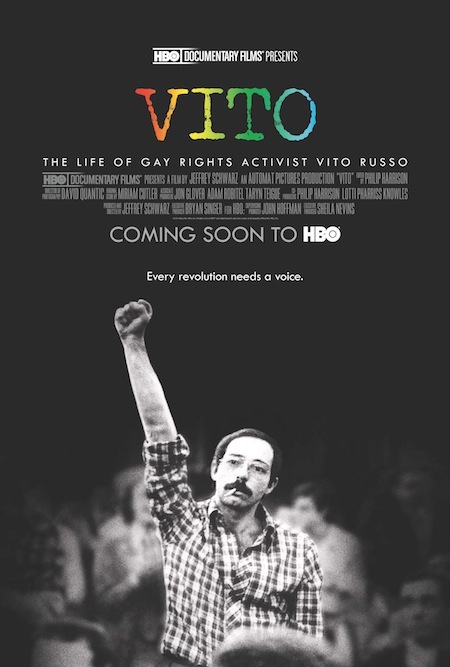 On Friday October 14, 2011, rapt film fans who fill an auditorium are treated first to a screening of the new film Vito: The Life of Gay Rights Activist Vito Russo and then to a rousing post show conversation moderated by New York Film Festival selection committee chair Richard Pena. A political more than a personal history, though of course all details are fair game. This movie of heart and politics and love of film and people shines. Vito’s story is a personal and cultural and historical one. Our relationships to him and to his legacies as readers and political persons and film fans and yes even Garland fans resonate in nuanced variations. I first encountered his work through the publication The Celluloid Closet (the revised paperback edition published in 1987) and the HBO distributed 1995 film The Celluloid Closet based upon this masterful assemblage of homosexuality in the movies. I learn at this screening that this personally pivotal film premiered at the NYFF October 13, 1995, 16 years (almost to the day) before tonight’s screening. I learn from tonight’s moving and artfully constructed story that these works (book and film) stem from research the movie-loving researcher and activist Russo conducted over a series of years leading to popular public presentations he provided to eager audiences across the country. Pena points out in his introduction to the film that for Vito, the quintessential New Yorker, this film’s premiere at the New York Film Festival is a kind of home town event. Vito was born in East Harlem and moved with his family to New Jersey in his youth — a move that did not sit well with the urban and arty and openly gay young man. He proclaimed to his mother when he was sick in Manhattan and she wanted him to come to New Jersey so she could care for him: “I’d rather die in New York than live in New Jersey.” In addition to being a fabulous laugh line in the film as quoted by another relative, this line may provide a summation of his life. This is a man of political passions and sentimental celluloid dreams. An important and beautiful film that HBO will show starting in June 2012. Lucky for all of us. Rather than provide a history lesson in dates and achievements and the famous people he knew, I’ll end this reflection with a simple and profound statement of inclusion. The editor is actually Philip Harrison. Thank you for this comment — correction made to the panel photograph caption.